When trees or buildings block the rays of the sun and create a shady space in the garden, plants with bright foliage are worth their weight in gold. In such situations, designers and gardeners often rely on plants with yellow and golden foliage to mimic the warmth of the sun and brighten the scene. In this context, “just right” usually means sites that aren’t too shady, but they can’t be too sunny, hot or dry either. Most gold foliage plants require some sun to bring out their bright colors, but if they get too much sun, or it’s too hot or dry, their more sensitive leaves can scorch. For that reason, lots of gold plants perform best with morning sun and some afternoon shade. Still, some gold plants can take full sun and others show off their golden traits even in dense shade. Whatever they need, when conditions are “just right,” gold foliage plants capture the brilliance of the sun and echo it into the garden scene, giving off a sunny glow that catches the eye and brightens borders. Gold in the landscape creates “visual movement and variegation in the larger sense to provide visual contrast that sets everything else off,” Leichty said. Gold foliage plants are very popular, so Oregon growers such as Little Prince of Oregon offer a wide assortment of them. Vibrant gold foliage can be found among sedums, such as Sedum macinoi ‘Ogon’, which is widely used in landscapes, Leichty said. S. reflexum ‘Angelina’ is the “go-to, quintessential golden ground cover.” ‘Angelina’ also anchors sedum “tile” mixes produced by Little Prince for use on roofs and walls, and as framed plantings on a table or wall. Variegated and golden grasses, as well as grass-like plants, work well in borders and mass plantings to provide sharp visual contrast and “set everything else off,” Leichty said. For instance, Acorus gramineus ‘Ogon’ is a good choice for moist sites, while the mini-version, A. g. ‘Minimus Aureus’, is frequently spec’d for use in vertical gardens. The very popular Hakonechloa ‘All Gold’ has arching, bright golden blades that can provide a “stunning effect,” Leichty said. Golden perennials, including Veronica repens ‘Sunshine’ and the trailing V. prostrata ‘Goldwell’, also sell well. Great golden and gold-variegated hostas include ‘So Sweet’, a miniature selection that is “very yellow” and ‘Great Expectations’, which has yellow centers and wide green margins. Hardy Fuchsia ‘Golden Herald’, which can take more sun than others, produces dramatic contrast with reddish purple blooms and intensely yellow foliage. ‘Enstone’ has a golden look from variegation on the foliage. Broadmead Nursery also offers customers (landscapers, rewholesalers and brokers) golden perennials and grasses that “brighten up shady spots and add pizzazz to a scene,” according to Greg Brice, general manager of the wholesale container nursery in Amity, Oregon. Gold foliage “adds a depth of color to shadier sites, which is especially effective in landscapes when contrasted with plants that have darker, contrasting features,” Brice said. For instance, gold foliage pair well with plants like Ophiopogon p. ‘Nigrescens’, Helleborus orientalis, Sarcococca ruscifolia or S. confusa, and Vaccinium ovatum “to add a depth of color to a shadier site,” he said. Selections that can tolerate more sun can complement more sun-loving plants, such as Ceanothus thyrsiflorus ‘Victoria’, darker varieties of Physocarpus opulifolius (‘Diablo’, ‘Summer Wine’, ‘Coopertina’ or ‘Center Glow’), or even Prunus laurocerasus ‘Otto Luyken’. “A combination of gold foliage and unique texture makes plants really jump out,” Brice said. He named gold grasses that have delicate but dramatic foliage, such as Carex elata ‘Aurea’, C. e. ‘Bowles Golden’ and Dicentra spectabilis ‘Gold Heart’. “Yellow-foliaged plants are super hot in the U.S.,” according to Angela Treadwell-Palmer, founder and co-owner of Plants Nouveau, a company that helps breeders bring new plants to market. Selected by horticulturist Richard Davis of Virginia, ‘Lemon-Lime’ foliage emerges chartreuse, then the top foliage stays bright yellow while the older foliage turns deep, grass green, giving a two-toned effect. Also from Plant Nouveau, Eryngium xzabelli ‘Neptune’s Gold’ is the first all-gold-leaved Eryngium. Leaves emerge bright yellow, fade to chartreuse then age to a lovely gold and green combination that contrasts with steel blue stems and flower heads. The eye-catching color doesn’t burn, and totally stable plants never revert. It makes a great addition to mixed borders with other summer-blooming perennials. 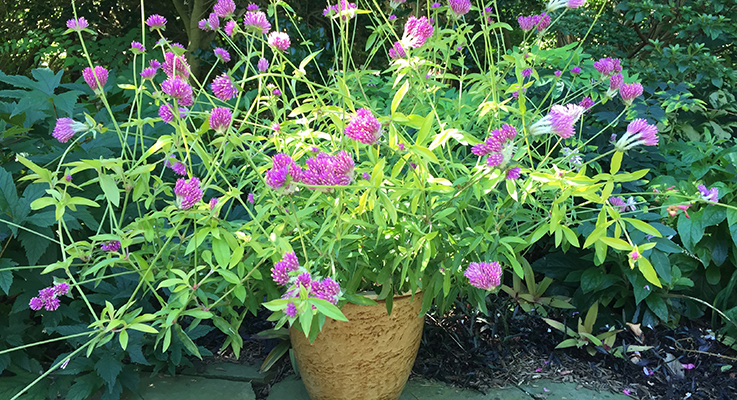 A new annual for gardens and containers, Globe Amaranth (Gomphrena ‘Cosmic Flare’) produces a “shockingly beautiful combination” of chartreuse foliage and magenta flowers all summer long. Cody Hahnlen, sales representative for Youngblood Nursery in Salem, Oregon, also reported strong demand for gold foliage plants. “More landscapers are using gold plants for eye-catching designs, and garden centers are carrying more varieties of unique and vibrant plants for the DIY customers,” Hahnlen said. Washington and Oregon customers drive consistent demand at Youngblood, especially as gold foliage is showing up more in display gardens and more options are reaching the market. Youngblood offers perennials, evergreen grasses, shrubs and conifers with gold foliage. “Evergreen plants with gold foliage are tops for popularity, since we can enjoy their color year round,” he said. Hahnlen also recommended Cephalotaxus harringtonii ‘Korean Gold’ (Japanese Plum Yew). New foliage emerges bright yellow and mellows to dark gold as it ages. The slow-growing conifer does best in part shade but also requires some sun for a good display of gold. For an evergreen golden grass, Hahnlen recommended Acorus gramineus ‘Variegata’ for a site with morning sun and afternoon shade. Attractive clumps with golden-yellow variegation prefer moist soils. Youngblood Nursery also grows a number of variegated hostas that “make any shady spot in a garden pop with bright gold and yellow colors,” Hahnlen said. ‘Stained Glass’, which won Hosta of the Year honors in 2006 from the American Hosta Growers Association, is one of the favorites at the nursery. It has huge, bright gold leaves edged with a wide, dark green margin. The “incredibly vigorous,” sun-tolerant plant makes a clump 3–4 feet wide. Hahnlen’s “very favorite conifer” at Youngblood Nursery is Chamaecyparis obtusa ‘Tetragona Aurea’, which boasts rigid, columnar growth and fern-like golden foliage. “It can become the plant you plan a garden around,” he said. Since it grows relatively quickly for a dwarf conifer (6 to 8 inches per year) to 10 feet, it makes a striking specimen plant without much wait. Full sun brings out the best golden colors. The nursery tries to define for customers the “just right” conditions these gold plants desire for best performance. For instance, Juniperus horizontalis ’Mother Lode’ is adaptable, but variable depending on conditions, Dittmar said. Grown in more shade, its color is a softer yellow; grown in full sun and high humidity, its color is brighter. But if the sun is too hot, it can burn. An exciting new golden selection of upright arborvitae from Poland, Thuja occidentalis ‘Jantar’ (PP22296), was named for its dramatic amber color in winter (“jantar” means “amber” in Polish). During summer, foliage is bright yellow, but in winter, “when the sun is on ‘Jantar’, the amber glows,” Dittmar said. Unlike most hemlocks that prefer part shade, Tsuga canadensis ‘Golden Splendor’ produces its best yellow in full sun without burning. As a specimen or sheared into a hedge, it grows quickly and makes a brilliant show. A low, wide selection of Abies koreana, ‘Golden Glow’ offers a hint of gold in its spring and summer foliage, but really comes into its own in winter, when the cooler temperatures trigger a striking shade of gold. Some protection from the hottest sun produces the “just right” conditions for this little gem. Iseli offers nearly a dozen golden selections of Hinoki false cypress (Chamaecyparis obtusa), including ‘Fernspray Gold’. A newer selection called ‘Sunlight Lace’ deserves wider use for its year-round bright yellow foliage, fine foliage and lacy look. The tree produces its most intense color in full sun, but protection from the hottest, late afternoon sun will prevent the possibility of sunburn. Old Germantown Gardens, a shady, two-acre masterpiece of horticultural adventure in Northwest Portland, utilizes lots of gold foliage to brighten a site shaded by towering trees. Co-creator and owner Bruce Wakefield finds Robinia pseudoacacia ‘Frisia’ to be a great tree for yellow foliage — so great, in fact, that he has two of them. Options for gold foliage abound, and Wakefield recommended other plants with golden foliage for Pacific Northwest gardens, including Cotinus coggygria ‘Golden Spirit’, Metasequoia glyptostroboides ‘Gold Rush’, Picea orientalis ‘Skylands’, Cornus sericea ‘Hedgerows Gold’ and Calocedrus decurrens ‘Berrima Gold’.